Taking care of the planet, by practicing eco-friendly gardening techniques, is a great way to help local birds, butterflies and other garden wildlife. It is also a way to create a WONDER-full life. Every time you garden green, you are helping to protect and preserve habitat for local wildlife. The process is so magical and mystical that it reminds me of the classic line from one of my favorite Christmas movies, It's a Wonderful Life. At the end of this happily-ever-after movie, George Bailey and his friends and family are singing Christmas carols when a bell on their Christmas tree rings, reminding young daughter Zuzu that "every time a bell rings, an angel gets its wings." In widlife gardens, the surprises are just as magical. Eliminating chemicals, using native plants and conserving water are all great for the planet and for local wildlife. So to give your family a gift that lasts a lifetime, make plans to start (or continue) an eco-friendly garden this spring. 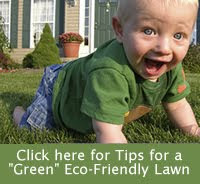 You will soon feel the same way that I do: that being a green gardener IS a Wonderful Life. And every time you garden green, a butterfly gets its wings. I hope you will join us on the Metro DC Lawn and Garden blog as we learn to create environmentally friendly landscapes together. You can subscribe (at right) and follow us on Facebook to join in the conversation. Be sure to add any suggestions or questions you'd like to learn more about!